Because every business is unique. If you rely on increasingly complex spreadsheets to identify how things are going, how do you extract the really important stuff to gain attention and generate action? At Digi we work with major blue-chip brands, building custom systems to meet their specific business needs. We can take virtually any data (uploaded, FTP, encrypted web services, etc) isolate the key data and then communicate to your audience exactly what you want them to see, always clear, always branded and focused on what really counts. 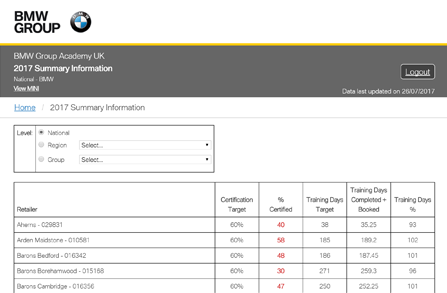 Setting complex annual training targets for a dealer distribution network is the start for BMW Group Academy. Then they need to keep their dealer network fully aware or progress towards complex annual training targets for the teams at each location. Regular emails inform the head at each business of progress and forecast year end, what's on track and what needs attention. Strong branded visuals highlight what's important, to the people who need to know. Then can drill down to view the detail and get things going. All without a single Excel spreadsheet ever getting in the way always up to date and a single reference for every dealer, region, group and national management. Tell us a little about your business and level of customisation you desire. We'll discuss the details with our team of developers and send over a personalised quote.